On a trip to the Tiwi Islands just north of Darwin, Greg Clarke observes how sport and art offer visitors a portal into a unique culture, and act as a safety valve for a community that lives on the very edge of Australia. On Bathurst Island, a fella from the Tuyu Buffaloes runs hard across an expanse of grass. Light on his feet, and with the balance and poise of a ballerina, he’s right on the tail of his quarry. He brings his target to the ground, near to where the Tuyu mob is watching – a great crowd of brothers, sisters, cousins, aunties, uncles, sons and daughters. They feast on his efforts and roar their approval. He’s won himself a free kick in the biggest game in town. It’s grand final day on the Tiwi Islands and the Tuyu Buffaloes are playing the Imalu Tigers. The Tiwi Islands are located close to where the Arafura Sea joins the Timor Sea. They comprise two main islands, Melville and Bathurst, and five smaller islands. The combined area of the islands is some 8300 square kilometres. For around 2500 people, including 40 or so of European decent, it’s home. Australian Rules football is more than a sport here – it’s an integral part of the culture, a shared passion that binds the community. Know something – anything – of footy and there is an opportunity for a rapport with islanders, a chance for appreciation and understanding, the possibility of connection. Visitors need a permit to visit the Tiwis Islands, but not on grand final day. On this day the islands, its people, its art and culture are open to the world. “Ngawa kukunari ngini nuwa awungarra kapi nginingawula murrakupuni, Awi,” (We are happy that you are here in our country, in our land, talking to everybody) is a Tiwi welcome. If ‘talking to everybody’ seems a little ambitious, it’s not as improbable as you might think. Not on grand final day anyway, when almost everyone from the islands’ communities is at the game. A posse of us arrives on the morning of the grand final after a 20-minute light plane flight from Darwin. Just about all I know of the Tiwis is what I first see: gum trees, pandanus palms, long grasses and a puddled red dirt track from the airport. According to one local, Bathurst Island had just four tourists in the first three months of 2012. Today, however, the island is buzzing and bus-loads of visitors are being shuttled to various points on the island along muddy roads. Before the football kicks off, Brian Clancy, a development advisor for the Tiwi Land Council, takes us around Wurrumiyanga (formerly Nguiu), the largest settlement on Bathurst Island. Art and football mix perfectly on grand final day. The pilot was reportedly the first Japanese POW in Australia. He survived the encounter and the war, and many years later his grandson came to the islands to thank the Tiwis for his grandpa’s survival. I’m keen to part ways with Brian despite his effortless bonhomie. Wandering Wurrumiyanga I hear the sound of singing, of voices every bit as beautiful as forgiveness. I’m lured into a church where a troupe of older women is singing. Aussie Rules is considered one way to help break these social cycles. “Hopefully, if we can get their interest in football, they play for the NTFL [Northern Territory Football League], then they can get picked to go down south,” Kathy adds. She isn’t referring to wilfully shipping men off the island, rather to nurturing a further purpose, helping them stand tall, heads up, in life and in their communities. From the 1990s to around 2005, the islands reportedly had the highest rate of suicide per capita in Australia. Some of the telephone poles around Wurrumiyanga have spikes protruding from them about half way up. People, men mostly, would apparently climb the poles to the wires and electrocute themselves, often in front of a crowd. According to Brian the communities have successfully fought this terrible trend. “We’ve pretty much stamped it [suicide] out,” he says. Jacinta Tipungwuti (centre with microphone) leads members of the Strong Women’s Group in song before the start of the game. Football has played its part. The Tiwi Bombers, a representative side that plays in the NTFL, was fully founded to alleviate the suicide crisis, to give people something to aspire to, and perhaps an anchor. The night before our visit they had, for the first time, won the NTFL grand final. Change is happening. A reinvigorated Tiwi Education Board was formed some five years ago. “We’re four years into a 10 year plan,” Brian had said. “We’re on the cusp of getting things right.” These islands have never been subject to land rights claims – they have always belonged to the indigenous islanders. Art is also an important expression of Tiwi life, just as footy is, and on the same day as the grand final, an art sale is held. Art purists might be horrified by this fusion of art and sport, but on the Tiwis it’s gloriously impossible to separate art and AFL. 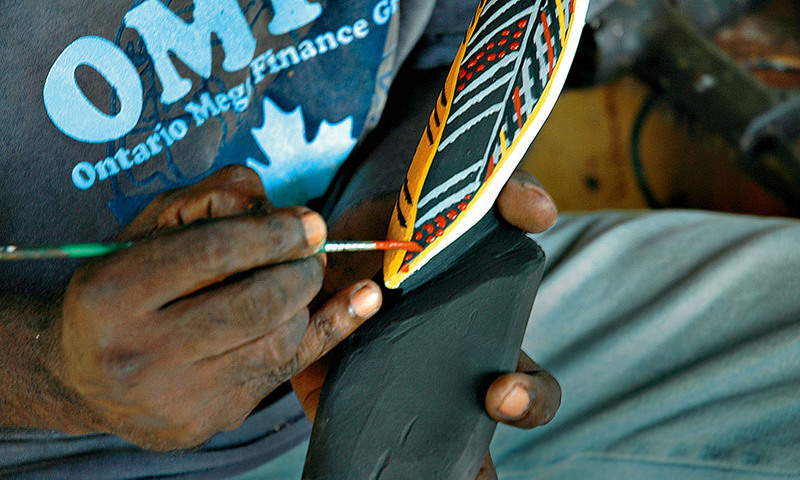 There is strong national and international demand for Tiwi art. Some paintings and sculptures can be worth tens of thousands of dollars. It’s a second or two before I realise what he means. The birds keep them safe from the crocs. We share a country, but this is life a long way removed from the existence of most Australians. As if to underline this point, a dingo is lurking out the back of the gallery, near to where David is painting. It’s a fullblood Bathurst Island dingo according to John Naden who runs the gallery. John found him as a pup, out in the bush, almost certainly about to die during the dry season. “We were hoping he’d grow up and leave home but he’s just hung around,” John says. Kantilla is one of the storied names on the islands. David Kantilla, Ken Wayne’s dad, played in the South Australian Football League in the 1960s, the first indigenous fella, according to Ken Wayne, to make the trip to the big leagues south. The Tuyu Buffaloes are premiers and Kenny Puruntatameri (left) and injured team mate Gilbert Alimankinn get their hands on the trophy. Another Tiwi name is no less august – in fact it’s one of the most revered names in AFL/VFL history. Current AFL star Cyril Rioli is a premiership player with Hawthorn and you could put up a fine argument to suggest that, of all the some 700 players in the league, he has, hidden somewhere within his sleeveless jumper, the most magic of any of them. Cyril is following uncle Maurice, a star for Richmond in the 1980s, who had footwork to make boxers weep. There are eight football teams spread across the Tiwis, based very loosely on the eight traditional land owning clans. Willie Rioli is the coach of the Tigers and brother of legend Maurice, who died too young in 2010. I meet Willie opposite the football ground, where his players are warming up for the game under cooling trees. Willie is surprisingly relaxed and generous with his time. “It’s just great for anybody and everybody to come, for other people to experience our culture and vice versa. It’s a two-way thing,” he says. The grand final is quick, open and skilful, the fellas from both teams smartly doing justice to their predecessors’ legacy. The Buffaloes have a little more finesse, and lead for much of the game, by a healthy 42 points at the start of the final quarter. Yet Willie’s Tigers haven’t been taught to roll over. Neither have their supporters. They cheer wildly as each last-quarter goal cuts the lead by half. There is a whiff of an extraordinary victory, but the Buffaloes steady, then kick away with some late goals. Tuyu wins comfortably, but not without the final quarter scare. It’s a grand and thrilling game. Far more rousing is that its influence may extend beyond the oval’s perimeter, beyond the day, the islands and its people. The Tiwi islands have approximately 1000 kilometres of coastline. Barramundi bigger than a rock god’s ego cruise the waters and some of the island’s first forays into tourism include fishing lodges. There are beaches too, of course, but people don’t visit for the castaway option; the saltwater crocs and blue-ringed octopuses tend to shade that experience somewhat. Of roughly 600 permit-less visitors who arrived on Bathurst Island on grand final day, it’s highly probable every single one of the first-time visitors returned to Darwin after the game. There are just a handful of lodges that have recently on the islands, but gloriously no big resorts are planned. On the Tiwi Islands, any connection, any attempt at connection, will bring unconfected reward. A number of small airlines run scheduled flights to the Tiwi islands from Darwin. Hardy Aviation operates daily flights to Bathurst Island. The Tiwi Islands are privately owned. Except for grand final day visitors to the islands require a permit. According to the Tiwi Enterprises website, ‘The permit system is designed to strengthen the Permission Principle at the cultural heart of Tiwi land management’. It is largely based on respect. Some permits are free. Tiwi Tours is owned by the traditional owners of the Tiwis but the business is run by AAT Kings. The one-day Tiwi Islands Aboriginal Cultural Experience departs from (and returns to) Darwin. It costs from US$230. Tiwi Adventures, owned by the Tiwi people, runs fishing trips to various lodges on the islands. The Melville Island Lodge is on the shores of Snake Bay. Prices start from US$2170 and include air transfers from Darwin, accommodation, meals and fishing guides.